Baklol video is one of the Most popular Featured viner with 4M subscribers on Youtube and 2.7M followers on Facebook. Sociopool feels proud to be their support system on each and every step. Baklol video has always been consistent in creating content for their audience, which is the secret of their success. Recently they got Youtube Gold creator award. Half engineer is the most trending YouTuber, whose each and every video goes trending on YouTube. With his dedication and hardwork, he has got such a huge subscriber base. The idea of giving message at the end of videos is gonna take him far in his journey. Sociopool feels proud to support him in all manners. So Effin Cray is one of the channel dedicated to produce the most interesting video content with Sociopool. They have a follower base of 582k on Facebook and 4 Million subscribers on YouTube. Their one of the most viral video “Girls Vs Boys In School Life” goes on trending on YouTube and got 11 Million views on Facebook. khandesh Group is the most heading youtuber , whose each and every video goes on trending on YouTube. Their funny and innovative ideas are being liked by every age group. His most viraled video is “Chotu Ke Golgappe” with more then 255 M views. The hungama films- ab mauj legi dilli, who recently got Gold play button, is one of the biggest prank channels on Youtube with a subscriber base of more than 2.5M. Their funny and innovative ideas are being liked by everyone. If “Laughter is the best medicine”, The hungama films is very well serving that medicine to everyone. Nazar Battu is a start-up OnlineTV, where you can watch regular shows and content, created especially for the young audience, across genres. In collaboration with sociopool many of their content got viral. One of such video “Bharat Ka Abhinandan” got 9 Million views on Youtube. The Baigan Vines is a group of artistic cast who brings you videos, memes & entertainment in Pakka Hyderabadi Style.Their fan base is tremendously hike on YouTube with Integration of sociopool. The Baigan Vines is a complete package of entertainment and always comes in trending on YouTube. Aashqeen is an Indian famed star who gained huge fame through posting funny and comedy videos on social media. 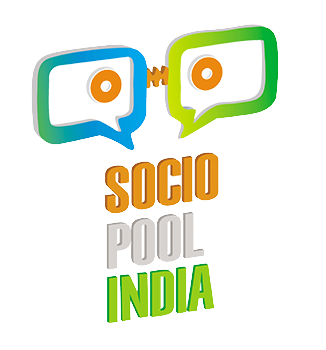 In collaboration with Sociopool, Pindrop App was viraled on every social platform including watsapp groups through video “How do girls act when they are alone” having 57 Million views on facebook. Your one stop destination for funny content & latest happenings in our country is RVCJ Media. This page has grown tremendously on every social media having a follower base of more than 14 Million on Facebook and 612K subscribers on YouTube. The Visual Radio, A group of talented cast has shown tremendous growth by gaining huge follower base. Their content is very interesting varying from different versions of famous TV serials to digital commercial videos with a superb comic timing. We Are One is one of the best YouTube Channel , they invent very funniest videos,which is full of comedy in desi language and are best comedian.It is a hub of great entertainment and its comedy charaters are unique. At present he has more than 9.83 lacs subscribers on YouTube. Comedy Actor Virat Beniwal is a very popular face on social media. Within a short period of span he got lacs of followers on these platform with the help of Sociopool. At present on Facebook and YouTube he has above 1.4 Million followers and 1.1 Million subscribers. Rachit Rojha has shown a tremendous growth with sociopool in a short span of time by creating Desi content, which got him about 9 lac followers on Facebook and 1.1 Million subscribers on YouTube. His one of the most popular video “Don’t underEstimate Anyone” became a slogan for Desi people and everyone started using it. Gaurav Arora (an innocent and figure of fun) is one of the best comedian whose comic material is completely clean and suitable for all audiences and environments .His comedy involves keen observations of daily life, people and funny encounters with them. Gaurav gifted with a talent of natural acting makes him a unique and versatile actor.His most viraled videos “Khanai School Examination” and “Bachpan Ki Vo Duniya” have millions of views. Bakkbenchers is a group of talented cast having their own production house which make funny and interesting content on real life aspects with Sociopool team. They have a follower base of 701K on Facebook and 188K on YouTube. Ootpataang Production is one of the most popular production house in the entertainment industry on Sociol media. Sociopool has helped them in the best way. They has always created the best funniest content for their audience , which is the trademark of their success. Namra Qadir is an actress and one of the most fascinating personality who creates quite smashful videos that goes trending on social media. She has reached more than 271k subscribers on YouTube within a Short span of time with the help of Socioool. Her most famous video “Intkam” has got viral on YouTube. Comedy actor Nishant Chaturvedi has win hearts of people with his innocent looks. With the help of Sociopool his follower base has increased tremendously on every social media. His content for City Vs Desi is quite famous among the youth. He leaves an impact on his follower base with his diverse skills. Pawan Utwani is an actor and a super model . He has worked in various TV Commercials such as Yeh Hai Mohabbatein and Kitchen khiladi With Sanjeev Kapoor . He is a shinning star of Bollywood. Sociopool directs him in all possible ways.